EPMA works by bombarding a micro-volume of a sample with a focused electron beam (typical energy = 5-30 keV) and collecting the X-ray photons thereby emitted by the various elemental species. Because the wavelengths of these X-rays are characteristic of the emitting species, the sample composition can be easily identified by recording WDS spectra (Wavelength Dispersive Spectroscopy). 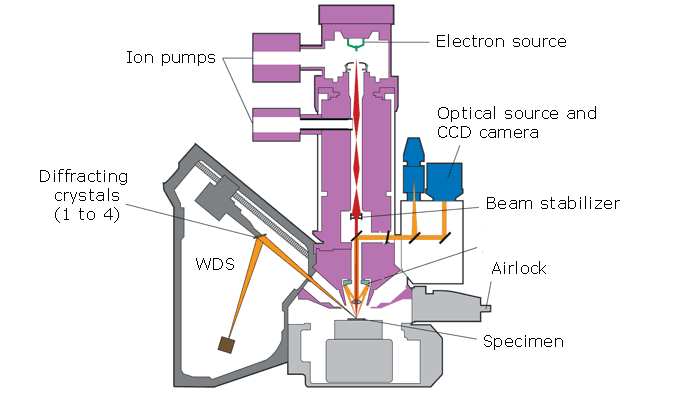 WDS spectrometers operate based on Bragg's law and use various moveable, shaped monocrystals as monochromators. EPMA is a fully qualitative and quantitative method of non-destructive elemental analysis of micron-sized volumes at the surface of materials, with sensitivity at the level of ppm. Routine quantification to 1% reproducibility is obtained over several days. It is the most precise and accurate micro-analysis technique available and all elements from B to U and above can be analyzed. EPMA is fully compatible with routine analysis sessions, with easy and direct interpretation of the results. EPMA instruments are equipped with a complete kit of built-in microscopy tools that allow simultaneous X-ray (WDS and EDS), SEM and BSE imaging, plus sophisticated visible light optics; they provide very flexible sample inspection with image magnification ranging from 40 to 400,000. Determination of thickness and elemental composition from nm to mm thick layers in stratified materials is possible. EPMA provides much better results than standard SEM/EDS systems. Because of the internal properties of WDS, the general sensitivity, analysis of light elements and risks of erroneous interpretation of qualitative spectra are all superior with EPMA. Spectral resolution and detector dead time are much better than EDS (Energy Dispersive Spectroscopy). The excitation beam regulation system and sophisticated sample stage capabilities guarantee that this technique provides outstanding stability and measurement repeatability. EPMA has been linked to CAMECA since this technique first appeared on the industrial scale. Working in close collaboration with Prof. R. Castaing of the Université de Paris and based on his research, CAMECA introduced its MicroProbe MS85 on the market as early as 1958. Worldwide acknowledgment came quickly and this instrument has since benefited from continuous improvements and adaptation to the new analytical challenges. Download our EPMA Tutorial: a 32p booklet providing history and background as well as a practical introduction to the technique, insight in the operation of an Electron Microprobe instrument and several case studies.